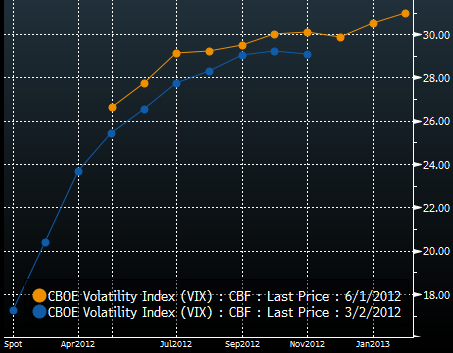 A few months back we discussed the record steepness of the VIX futures curve. Equity options traders did not trust the rally in stocks, bidding up the longer dated vol. Of course they happened to be right. In fact the futures curve turned out to be a reasonably good predictor for VIX and the VIX curve. The curve is now considerably flatter, with expectations of volatility persisting near current elevated levels for some time.